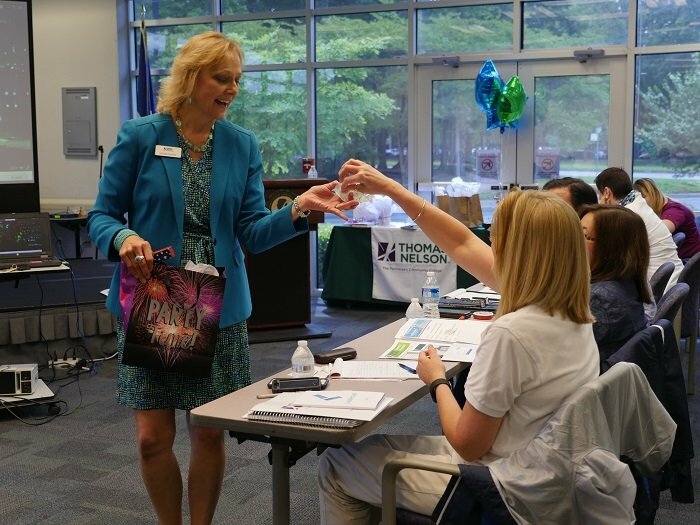 Thomas Nelson Workforce Development welcomed nearly 50 attendees at the Leadercast presentation on Friday, June 3. The daylong seminar was hosted by Michelle Manfred, director of corporate training and workforce services, and featured a pre-recording of the 2016 Leadercast conference, which welcomed more than 100,000 attendees to the live conference this year. This year's theme, Architects of Tomorrow, spoke to Manfred and reiterated the need to host Leadercast at Thomas Nelson. "We have to constantly prepare tomorrow's leaders," stated Manfred. "One speaker stated that some 85 percent of Americans believe we have a leadership deficit in the workplace, while 54 percent say we are disengaged. That's why we continue to offer Leadercast and other needed trainings." This year’s sponsors included Langley Federal Credit Union and Sentara Hospital. Langley sent more than 20 members of its team to participate in this year’s conference. “We have been looking for a leadership development program and this was a good opportunity and convenient for our team,” stated Marilyn Kuhn, Langley Human Resources. This year's conference was broken down into four sessions featuring speakers that spoke to leaders recognizing trends, needs and opportunities for change; skills needed to communicate your vision; motivating others to pursue the vision; and finally, success and failures in executing the vision. “Leadership is the willingness to help someone else for their benefit,” stated Saban who also shared that success comes from having the right mindset, vision and discipline as well as focused execution. Overall, each speaker spoke to the foundation of Leadership and the importance of a strong vision. Speakers spoke to passion as a driver for determining the vision and working toward achieving every goal set. They echoed that organizational success began on the individual level. If you are looking for more opportunities to share Leadercast with your team, contact Michelle Manfred at (757) 345-2855. Thomas Nelson also offers a variety of leadership, management, and workplace trainings that can benefit your team including Covey’s 7 Habits of Highly Effective People, and Customer Service training. Reach out to Michelle Manfred for additional information.